Une petite présentation de cet hélicoptère coréen, répondant au programme KUH (Korean Utility Helicopter), développé par KAI (Korean Aerospace Industries) (51 %) avec l'aide technique d'Eurocopter (49 %) pour, surtout, la transmission et le pilote automatique. L'appareil a effectué son premier vol la semaine dernière. The first flight of the Korean Utility Helicopter (KUH), known as the Surion, has taken place in South Korea. The 30-minute flight took place on March 10 at an air base near Sacheon. Watched by officials from manufacturers, Korean Aerospace Industries (KAI) and the South Korean Armed Forces the two pilots and one flight test engineer carried out hovering exercises including turns and taxiing. KAI says the flight test programme will see the aircraft flying at 140 knots and 2,000 ft by April. The Surion is the first indigenous helicopter produced by South Korea although heavy development support has come from Eurocopter. KAI has used local manufacturers for 60 percent of the aircraft's parts, including the rotor blades and health and usage monitoring systems (HUMS). Eurocopter have provided the gearboxes, rotor mast and autopilot. The company has also provided technical assistance by dispatching experts to Korea. The KUH programme was launched in 2006. The prototype will eventually be joined by a further three flight test aircraft. 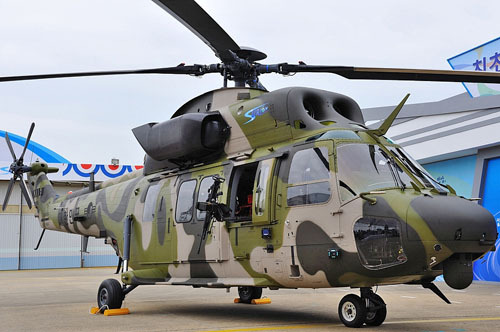 The first aircraft are due to enter service with the Republic of Korea Army in 2012. Some 245 KUHs are on order and will replace existing utility helicopters in the South Korean Army fleet including UH-1Hs and MD500s. KUHs will be tasked with troop assault, search and rescue, tactical lift, liaison and medical evacuation operations. There are also plans to build a commercial version of the KUH. KAI has ambitions to sell around 300 worldwide through a joint venture between the two companies. An official ceremony of the first flight will take place in May. Un peu compliqué ces coréens : deux premiers vols ! Ou alors ils avaient peur d'une catatrosphe lors du premier premier . Bon, rappelons quand même que KAI bénéficie de l'assistance technique d'Eurocopter. KUH-1 utility helicopter "Surion" de Corée. Dans les 300 en cde et peut être une centaine maintenant livrés localement, pour diverses branches de l'armée et de la protection civile ! Un crash récent peut inquiéter Airbus qui semble avoir participé aux rotors et au HUB principal, sans forcément les fabriquer (Licences etc ...), on ne parle pas du réducteur, à ce stade. A suivre de plus prés dans qq jours, pour un rapport préliminaire. Les infos ont juste un peu "Fuité"